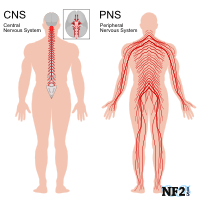 Neurofibromatosis (NF), which is a combination of three genetic diseases; NF1, NF2 and Schwannomatosis all result in the slow growth of typically Benign, non-Cancerous tumors, that can start to grow typically at birth, even if none are symptomatic till years later. 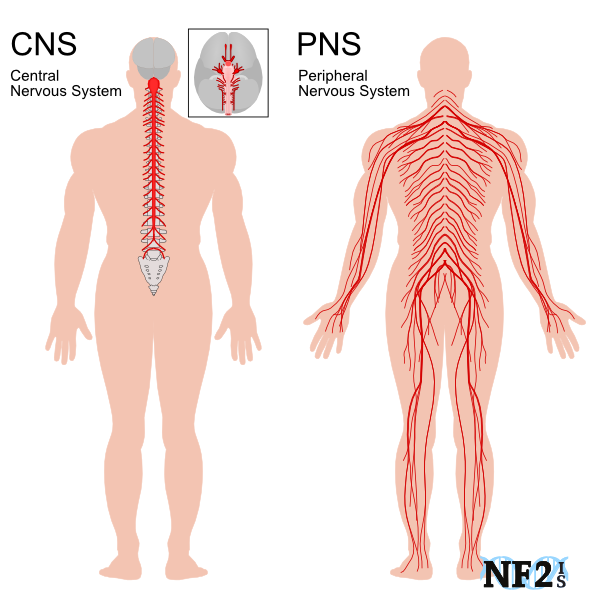 While each type of NF results in different nerve types and formations, the commonality between NF types is the result of nerve damage from tumor growth. Individuals with NF1 and NF2 tumors can become Malignant, Cancerous. Neurofibroma like Schwannoma grow attached to nerves, but in a different way. Cutaneous tumors are tumors that grow over the skin and but generally are not painful. Subcutaneous are tumors that grow anywhere under the skin and generally are painful. While there can be more, the following are typical tumor types for each forms of NF. Meningioma can easily develop throughout the brain. Schwannoma on nerves outside of the brain and spine which can only be seen with MRI.